The Concord Education Fund, (CEF) extends its thanks to everyone who contributed dollars, goods, talent, time, and totally awesome dance moves to the Concord Education Fund’s Annual Fundraiser. The CEF annual party raises funds for novel teaching ideas, new learning initiatives, and innovative academic programs at Concord Public Schools (CPS) and Concord-Carlisle High School (CCHS). Held at Nashawtuc Country Club on November 11th 2017, over 200 partygoers adorned with spandex, leather and way too much hair spray were treated to 80’s hits and humor compliments of DJ Tone Terra of Boston’s 5 O’Clock Gridlock on 103.3 AMP Radio, and local MC/Funnyman Jimmy Dunn of TV’s The McCarthy’s. While last year, CEF funding helped initiate the development of a new elementary innovation lab, this year CEF raised funds to help ensure the development of electives for CCHS Q5, when students will have the opportunity to select from more than 80 new electives that leverage the curiosity, knowledge, and passions of CCHS faculty. Integral to the success of the CEF party year after year, is the steadfast support of Cambridge Savings Bank (CSB). 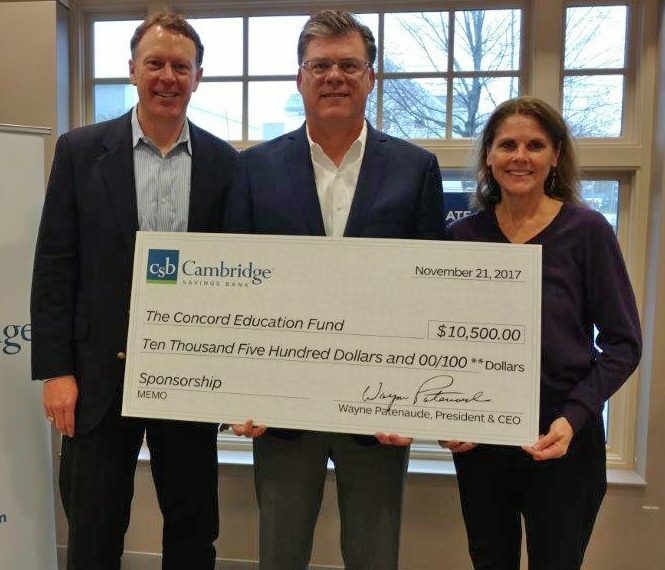 CEF title sponsor for the eighth consecutive year, Cambridge Savings Bank contributed a whopping $10,500 to the event, as well as highly coveted auction items and CSB team members to assist with registration and checkout. Wayne Patenaude, Presiden & CEO of Cambridge Savings Bank, flanked by CEF Co-Presidents Rick Hedeman and Suzanne Jachinowski. The entire CEF board extends its gratitude to CSB and the rest of our business sponsors and auction contributors for their generosity in support of CPS/CCHS teachers who are eager to offer students extraordinary educational experiences.